Yes, I plan to explain the version numbering system in an upcoming blog post. Looking back at our download records, it outdoes any previous release we've ever done by a factor of nearly four. Interestingly, it comes after a major slump in download numbers over the past six months, a.k.a. since we announced the GATK4 beta and the open-sourcing at the Bio-IT World meeting in May 2017. It looks like a lot of people were holding their breath waiting for the 4.0 release... I hope it was worth the wait. 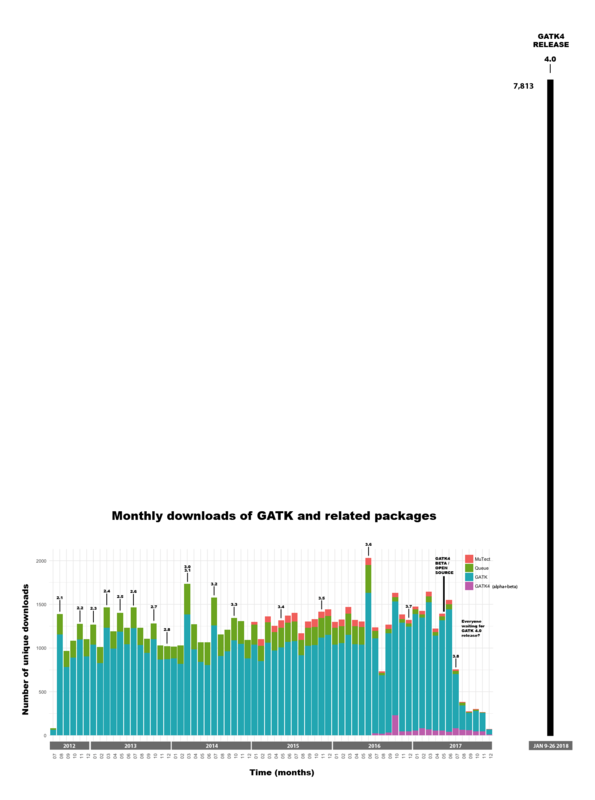 In case you're curious, the download stats for GATK 4.x versions come from Github and are conveniently available here. You can see that the count has increased since I looked it up earlier this evening! Download stats for older versions come from the GATK website (because we used to host the package ourselves) and are not directly accessible publicly.